Couch by Day – Bed by Night. The Futon is a versatile piece of furniture that has multiple functions. Comfortable as both a sofa and as a bed, this Futon Sleeper Sofa is a great value and will provide you or your guest(s) a comfortable place to sit or sleep. The Futon Cover is removable and in many cases machine washable. BURLINGTON MATTRESS is uniquely qualified to be your source for Futons. Our company was started with 14 Futons in a U-Haul trailer in 1984. 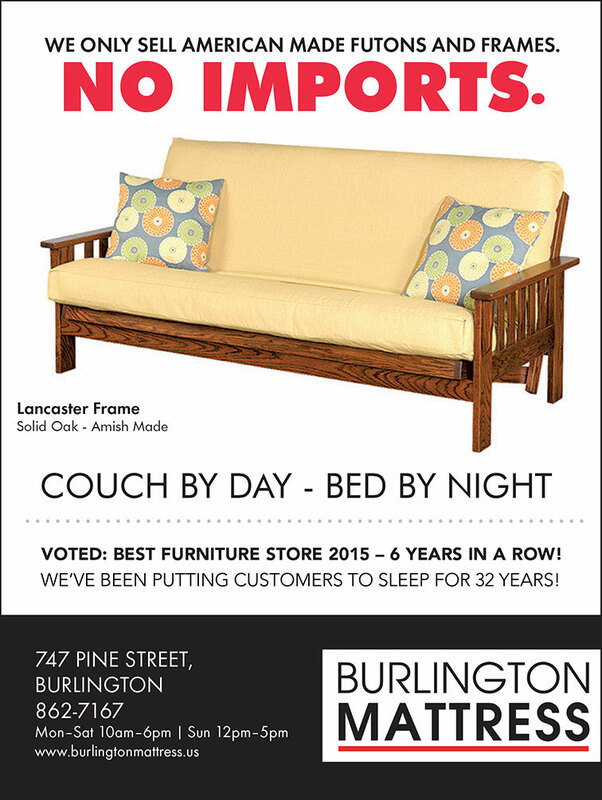 We have 32 years of experience starting out as the Burlington Futon Company. It is safe to say that we lived, breathed and slept Futons, as we became a Manufacturer and Wholesaler of Futons, Futon Frames and Futon Covers that were sold all over the United States. While we no longer make our own products here on site, we have designed and found Vermont and Amish craftsman to build exclusive well made solid hardwood Futon Frames to our specifications. We do not sell imported Frames that break. We used to travel the world to find fabrics to make Futon Covers. We understand design and the value of an attractive cover that performs well. We represent the two best companies that have an eye for design and can build tailored and well-built Futon Covers and Pillows. Whether you are looking just for a Futon Mattress or a Futon, Frame and Cover package we are here for you and proud of 100% American Made Futons and Frames we have to offer. YES, please send me more information about Futons! Welcome to Burlington Mattress, our NEW Specialty Sleep Store right next to our Burlington Furniture Store! We used our 30+ years of experience in selling mattresses to create a unique and welcoming environment where you will feel comfortable in exploring different mattress options. Our team of mattress professionals are well trained in providing sleep solutions that work for you. Burlington Mattress… We’ve been putting our customers to sleep for over 30 years! Copyright © 2019 Burlington Mattress. All Rights Reserved.